The Alliance, created as a counterweight to the countries of the Warsaw Pact led by the USSR, continued to expand after the Cold War and the collapse of the Warsaw bloc and was replenished with 13 new members. These are the main countries of Eastern Europe - the Czech Republic, Poland, Hungary, Slovakia. The Baltic countries are Latvia, Lithuania and Estonia. And as many as six Balkan countries - Croatia, Romania, Slovenia, Bulgaria, Albania and Montenegro. The NATO countries host the infrastructure of the American missile defense system in Europe. The missile defense system that Washington has been saying for years that it is needed to protect against missile threats from the DPRK and Iran. But the year 2014 put everything in its place and the United States recognized that one of the main tasks of the anti-missile system is to fight the “Russian threat”. 70 years is also sufficient time to think about what will happen next. The closest candidates to join the alliance are Ukraine and Georgia. What will happen if they become members of not only political but also military anti-Russian club? However, NATO has serious problems. A series of materials on Constantinople has already been published about this, and many details became clear on the eve of the 70th anniversary of the alliance. The topic is actively discussed in the Western media. In general, there are five main reasons that either prevent NATO from expanding further, or simply block the development of the military bloc in the future. What are these reasons? Since 2014, the new Maidan Kiev authorities have announced a course towards the inevitable entry into NATO. This task for the alliance has become even more urgent in light of the loss of the port of Sevastopol for NATO, where the plan was to have a real citadel of the American fleet on the Black Sea. But it did not happen. Now it is about using Ukraine in American interests by other means. This is already happening: more and more often, NATO airplanes are taking off for reconnaissance near the Russian borders not only from the British bases Waddington, Mildenhall and Fairford, but also from Kiev and Lvov. Yes, so far Ukraine is only focused on NATO, with great joy it is hosting American instructors and decommissioned military equipment. Petro Poroshenko earlier repeatedly promised to fulfill the necessary conditions for joining NATO. But the truth is that in no way can NATO accept Ukraine as part of NATO. The hang of this process, however, suggests that in Brussels and Washington are aware of this. In an article for the conservative American magazine The American Conservative on April 2, the well-known expert Patrick Buchanan agreed with this opinion. Buchanan warns that Ukraine’s entry into NATO will result in a great catastrophe, as allied commitments will force Washington to participate in all provocations of the unhealthy neo-nationalist government of Ukraine. That is why the current status of Ukraine for NATO is much more profitable, because the United States and without its membership in the alliance can do there what they want without having any obligations to this country. It seems that Kiev has no serious objections. The situation with Georgia is in many ways similar to the Ukrainian one. Former French diplomat Salome Zurabishvili came to power in the country, and she also proclaimed a course toward NATO membership. However, in practice, Georgia is not yet able to do this, and besides, it is of less value to the alliance than Ukraine. Georgia, meanwhile, is another problematic country in the post-Soviet space. Mikhail Saakashvili had previously been in power there, giving orders to his tanks to attack Tskhinval in August 2008. The mad Georgian demarche was stopped by a Russian operation to force Tbilisi to peace. South Ossetia and Abkhazia proclaimed their independence. Since then, the territorial issue is acute in this region. If the republic would then be a member of NATO, the United States would inevitably be drawn into a war with Russia. And this is no longer just a regional disaster, it is a global disaster. Washington, obviously, does not want the “tail to wag the dog,” and therefore, without firm guarantees of full balance and consistency of Tbilisi’s position with the NATO General Secretariat, and more specifically with the Washington Regional Committee, no membership in the alliance is out of the question. Besides, does anyone interfere with NATO ships to use the port of Batumi now, just like the port of Odessa? 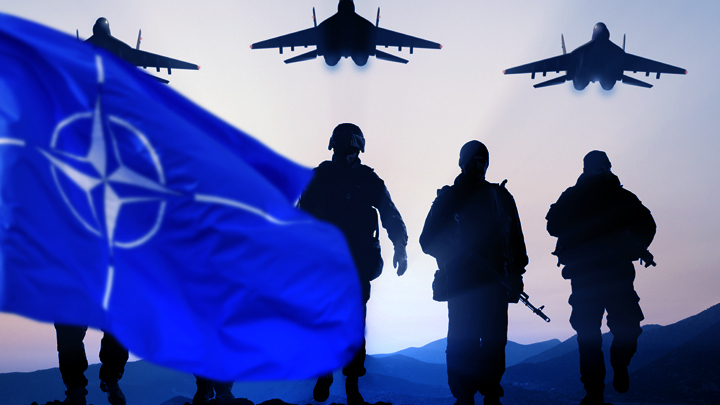 As soon as in 2018 the world media began to issue headlines that NATO was on the verge of collapse because of Donald Trump, it became obvious to the entire world community that the global crisis was starting in the alliance. NATO Secretary General Jens Stoltenberg, as recently as March 24, 2019, reiterated that NATO does not threaten anyone, because it is an exclusively defensive organization. What is most important for the defenders? To fight back together, to be a solid bastion and a united front. However, US President Donald Trump destroys this front. He demanded that all members of the alliance pay for their "protection" in the amount of 2% of their own GDP. This split the alliance. At the NATO summit in the summer of 2018, Trump made a real scandal. He scolded Germany, France and other countries for being stingy, and he did it in front of astonished observers from Ukraine and Georgia, which is prohibited by the regulations. Trump threatened to end NATO if his demands are not met. The head of the White House was adamant when advisers tried to tell him that the amount of deductions to the treasury of the alliance was not determined by the US president, but by the parliaments of the countries. Finally, Trump criticized the German Chancellor Angela Merkel so much that she did not hide her surprise and was completely bewildered. Seemingly Trump's intimidation should have had an effect. But no. And Germany became the very first country, the draft of the future budget of which not only does not provide for an increase in spending on NATO, but also at all indicates their reduction. Considering this position of Germany and Trump’s inevitability, a new big bang is ahead. And if we talk about the expansion of NATO to the East, it is impossible to imagine that a poor Ukraine would detach Washington 2% of its GDP. However, same as Georgia. There is no unity of the United States and other NATO members, not only about funding. The most serious example of the recent past and present is the differences of the USA and Turkey because of the F-35 and C-400. The United States is outraged by the decision of Ankara to buy Russian Triumph S-400 anti-aircraft missile systems simultaneously with fifth-generation F-35 American fighters. The American military still cannot fully realize how it is possible that both the “most advanced” fighter in the world and the most powerful combat system will be in one’s hands. Washington fears that the secrets of the F-35, having passed through Turkish hands, will soon be studied in detail in Moscow. Is Turkey right in its position? Sure. A few years ago, the United States set the condition for the purchase of fighters by Turkey and chose this country as a “service center” for F-35 maintenance. They expected a lot from the deliveries of airplanes to Turkey - Ankara would become the third largest importing country of the F-35 after Great Britain and Japan. Washington estimated a profit of $ 8 billion. Thus, Turkey not only became a repair hub, but also agreed to buy a super-unfinished F-35 for fabulous money. Commitments have been fulfilled. But if previously the United States simply talked about its discontent, and called on Ankara to choose between C-400 and F-35, now the rates have risen. US Vice President Mike Pence offered Turkey to make a choice - either C-400 or NATO membership. To this should also be added the differences of the USA and Turkey in Syria, the intention of French President Emmanuel Macron to create their own European army, and not just rely on NATO, Berlin’s position on the same finances and Nord Stream 2, which runs counter to Washington’s position . So far, only Eastern Europe demonstrates unity, and even then only around the notorious “Russian aggression”. He noted that this goal could be served by the revival of the Russia-NATO Council, which would not exist “for a tick” and would not mean concessions to Moscow. The Council would become a mechanism for determining common plans to fight the "global disorder", since the possibilities for its elimination are concentrated in the hands of Washington and Moscow. Robertson also pointed out differences in the alliance and the "need to pay his price" for "responsibility" to future generations. The ex-secretary general of the alliance sees a way out of the crisis both in the unity of the bloc members and in building a constructive dialogue with Moscow instead of endlessly blaming it. Summing up the analysis of these five reasons for the impossibility of NATO expansion to the East, we will say that they are as real as logical. Sooner or later, the alliance would have approached the borders of Russia at arm’s length and would simply have nowhere to expand in this direction. So in fact it happened, with the only difference that the alleged peripheral bastions of NATO are so weak and irresponsible that even to take them under protection is already a big risk. At the same time, internal contradictions are growing. Therefore, either NATO will become a really big consensus both among the member countries and globally, or, following only the Washington line, the alliance is waiting for the sunset and the impending collapse, which is becoming more and more obvious today.